Well, here I go again. Every year I say I’m going to post consistent content here on the main site, and never do. Oh well, maybe I’ll break the habit of quickly dumping all my pics on Facebook someday. Anyway! 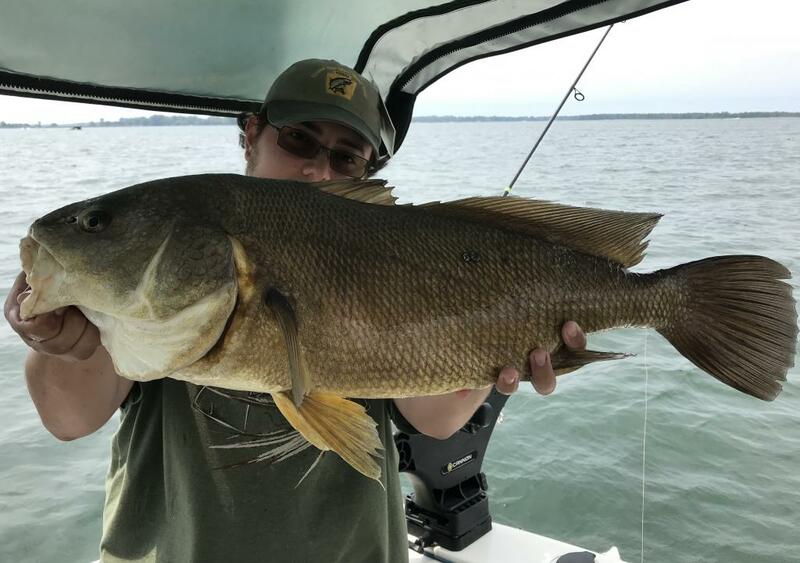 Caught this brute a couple weeks ago in the PA waters of Lake Erie. I was targeting Drum over mussel beds and had already landed several 17-20” fish on jigs before this guy showed up to the party. Once he ate, a long and heavy fight ensued, and lasted for about 10 minutes before this fish made it to the net. I was using an 8’6” medium-heavy rod with a 12# leader and there was still absolutely no stopping the barn door whenever it decided to take off on a 10-80’ run. A dozen blazing runs along the bottom and many powerful dives later, this big boi was in the boat. My scale was bouncing between 13 and 14 pounds so I’m calling it 13.5#, making it the second heaviest FW Drum I’ve ever landed! Second only to a guaranteed-14 pounder that I caught back in 2015. It's very cool to see you out there on the mussel beds targeting big freshwater drum. Nobody is really out there doing it, but I wonder why - seems like you have a whole lot of fun with them. Nice job man, and thanks for sharing. Drum really are an under appreciated fish, even within the RF community. Seems like almost no one targets them other than a small handful of people I know in western PA. I get that catching dozens of tiny ones while Redhorse fishing is annoying, but nailing these larger fish in standup tackle is a heck of a good time! Thanks Andy. A lot of people think drum are a trash fish, but they’re awful spunky at least on the first run or two. They eat alright and make excellent cut bait in my experience. The ones I catch on Lake Erie just keep going and never seem to slow down. Most of em take at least four or five good runs before I even get them close to the boat, then they just dive straight for the bottom for the rest of the fight. I swear Great Lakes Drum fight better than Mississippi watershed specimens, for some reason. Well, I’m a dumbass. I uploaded the wrong picture originally, that was just a 9-10# I caught the same day. I updated the pic so now it’s the proper 13-14# seen above.